David recently spent four months in rehab working hard alongside the Wellbrooke of Wabash therapy team. Step by step and stair by stair, he got a little stronger each day. When the time came for David to graduate, it was bittersweet! He was excited to be going home, but was heartbroken that Ethel, his dog of 13 years, would not be waiting for him to return. David had to leave Ethel in the care of others when he entered rehab at Wellbrooke. Little did David know that his therapists and nurses at Wellbrooke had been donating their own money to keep Ethel safe and well cared for at a local kennel. 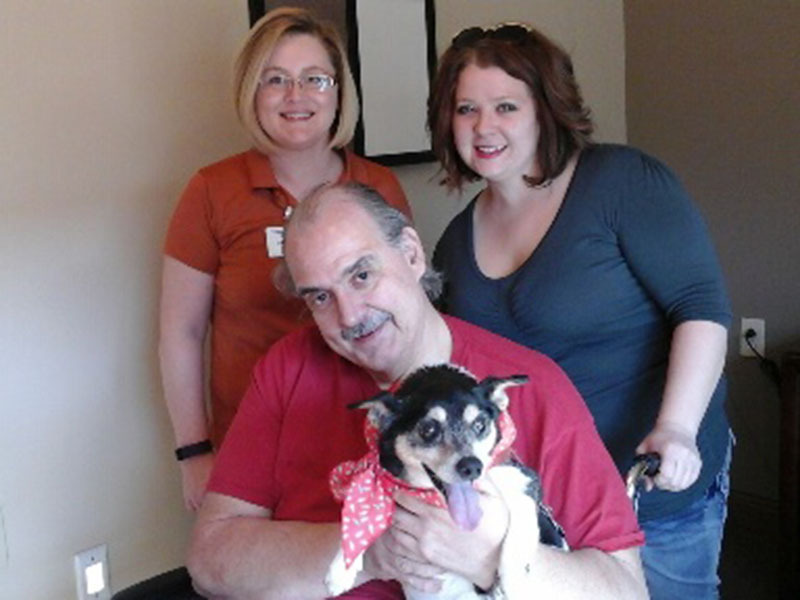 When the Saturday came for David to go home, his therapist Monica entered the room with Ethel in her arms! Happy tears instantly filled David’s eyes as he was presented with his beloved friend, as well as a bag of supplies for both Ethel and himself!